Mexican sunflower /Tree marigold | Infonet Biovision Home. It is indigenous to Colombia, Guatemala, Honduras, Mexico, Nicaragua, Panama, US and Zanzibar. It was introduced from Central America to other parts of the world. 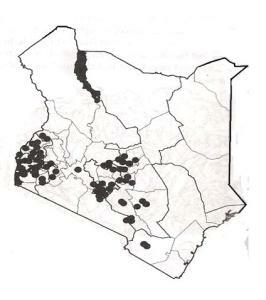 Here, in Kenya, is found in Western and Central Provinces as well as in coastal areas and parts of Rift Valley. It is native to Colombia, Guatemala, Honduras, Mexico, Nicaragua, Panama and US. It was initially introduced as an ornamental garden plant but escaped and is now found in hedges, along roads and on other disturbed grounds. Tithonia flowers and produces seeds throughout the year. It is recommended by scientists that it be used as green manure with or without addition of inorganic sources of phosphorus. It is also invasive and hence a potential weed. It also has moderate resistance to drought. Tithonia flourishes in an altitude of 550-1 950 m; mean annual temperatures of 15-31 degrees; mean annual rainfall of 1 000-2 000 mm and is may be found in agroclimatic zones II - IV. Fuel: Tithonia provides farmers with firewood of it burns up quickly. Medicine: The leaves are used as a medicine for constipation, stomach pains, indigestion, sore throat and liver pains. The leaves should be ground into small pieces, mixed with water, and then the juice drunk. It is also used in treating skin diseases (such as athlete's foot), night sweats, as a diuretic, hepatitis, jaundice and cystitis. Manure; Biomass from the existing locally available shrubs of tithonia that commonly grows on the fields and farm boundaries might be a more economic source of nutrients for crops than the biomass from planted trees as they grow faster and are readily available. Soil improver; maize is known to respond well when leaves and cuttings are applied. Best results are obtained with 5 t/ha of leafy dry matter being applied. It has also been observed that yields of kale, French beans, tomatoes and Napier grass all increased when these crops were planted with tithonia. Ornamental: In Kenya, it was first planted as an ornamental plant before escaping and started growing everywhere. Boundary: In some ares, tithonia is used for live fencing and boundary demarcation. Intercropping: Tithonia has a positive effect on crop yields when intercropped.